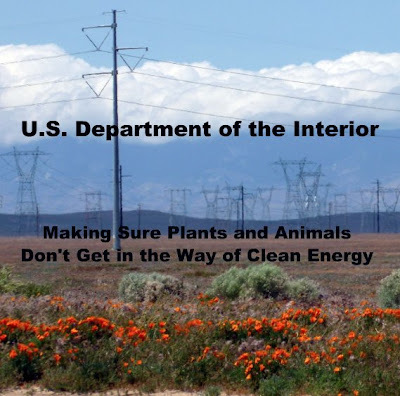 Secretary of Interior Salazar announced a dramatic change in the Department's mission today, complete with a new look for the government agency's seal. Looking over a map of America's southwestern States, Salazar said "it's time to step into the New Energy Frontier," referring to large-scale solar and wind energy facilities. "We've blasted mountain-tops in West Virgina for coal mines, and fracked groundwater with natural gas wells in Wyoming," he said, "but until now we have not found ways to industrialize the deserts in the southwest." Interior's new focus is to cover as many hillsides and valleys with massive fields of wind turbines and solar panels to reduce the need for destructive gas, oil, and coal exploration, according to Salazar.